Once installed and set up our water softener automatically performs a regeneration, supplies the entire property with softened water and has the added benefit of being able to use either block, tablet or granular water softener salt, however we recomend the use of tablet salt with this unit. One of the many features that makes this timer controlled softener stand out above other timer models on the market, is the flexibility in programming of the timer control. You can set the timer to regenerate the machine from twice daily if you have a very high water usage to specific days of the week or even days of the month if you have very low usage. The control panel can even be located upto a meter away from the machine should you prefer. All EMWC Water Softeners have a 5-year guarantee -at no extra cost! Because of its proven reliability, your EMWC water softener will have a five-year parts and one year labour guarantee. 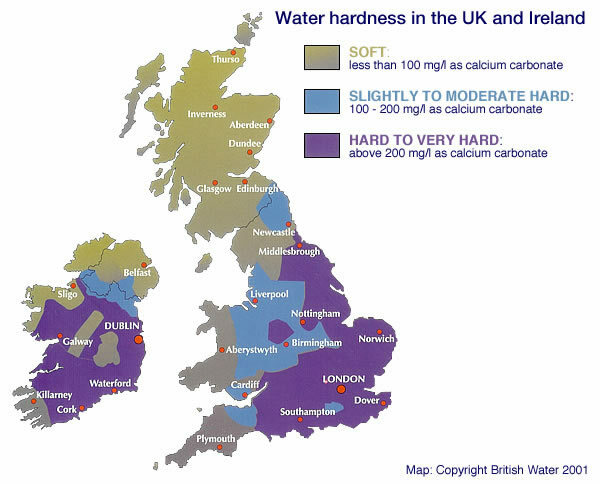 This, alongside our proven track record for producing highly reliable equipment, has established us as one of the UK's most popular water softener companies. MADE IN ENGLAND Because the water softener is manufactured in the UK it means not only is the product designed specifically for the UK market. And for our domestic water system it also means that we "wet test” before they leave the factory other companies do not do this, so you can rest assured that the softener firstly works but more importantly it doesn't leak. An EMWC Water Softener is very efficient in water use. It uses over 50% less water than a conventional softener during regeneration. Solvent free - food grade resin. There's something very special about an EMWC Water Softener, something that is unique and gives both incomparable performance and specification. The secret is in the resin that determines the quality of your soft water. All EMWC Water Softeners incorporate a resin that has been specially purified for household use. It is both food grade and free from chlorinated solvents (Solvent Free). No other manufacturer can offer you this level of specification. So whether you bath in it, shower in it, wash your hair in it, your clothes, or simply brush your teeth with it, the water from your EMWC Water Softener will not only be lovely and soft, but solvent free. Installing your Water softener - plumber or DIY? Every water softener comes complete with, fitting instructions and an option of an installation kit allowing for installation by a plumber or DIY enthusiast. Q "How often do I need to set the machine to regenerate ?" A: The frequency of regeneration is based upon water usage and water hardness. The harder your water the less softened water the machine can produce, the higher the water usage the more often the softener needs to regenerate. The setting is very much trial and error we suggest starting on a low setting and gradually increase, performing regular hardness tests to confirm the softener is able to produce soft water. Confirm that the taps that do not feel soft are being fed by the water softener. Check the settings on the softener, confirm that the regeneration frequency setting is correct for your area and water usage. Reduce the frequency setting and perform a manual regeneration. The softener removed the water from the tank but still overflowed what can I try ? Q I am going on holiday should I turn off the softener ? A: If you are going away for a prolonged period of time we suggest that you isolate the water supply to the softener but leave the electrical connection on. Although the softener may go through the motions of a regeneration it is not detrimental for the machine to do so without water. We suggest performing a manual regeneration after you re-establish the water supply to the softener. Leaving the electrical connection live to the softener avoids the need to re programme the unit when you return.